Figuring out directions and putting it all together to get to your destination can sometimes be confusing, especially if the area is new to you. We’ve tried to do some of the research for you, as you will see on the two “Getting here” pages. We know the area well, and our staff is standing by to assist you in getting here with as much ease as possible. Please contact us if you require any help at all; that’s what we’re here for! US International Gateway Airport: fly from Seattle, WA direct to Kelowna BC. Contact Horizon Air at 1.800.328.3461. 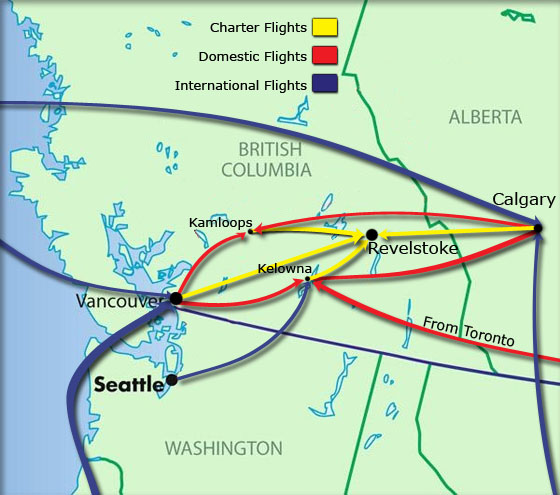 The Canadian international gateway airports: Calgary, Alberta (410 km East of Revelstoke on Hwy 1), Kelowna, BC (192 km South of Revelstoke), and Vancouver, BC (565 km West of Revelstoke on Hwy 1 and 5). Domestic flights: Available to both Kamloops (210 km) and Kelowna (192 km) South of Revelstoke.